This information is kindly donated by Andrew White who lives near King’s Lynn, UK. 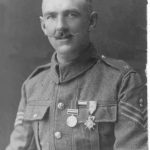 “My great-grandfather, Mr. Lawrence George Yates was a section leader of the Brandon Home Guard. He was a regular soldier in the Boer and First World Wars (Sgt Major in Coldstream Guards), and was a route-liner at Queen Victoria’s funeral. He then worked in Thetford and Brandon post offices. Later he became manager of the Avenue Cinema, Brandon.